Carpets are like the clothes for the floors of your home. Just like any other accessories, the carpets also need a special mention when it comes to interior decorating of home. There are various kinds of carpets, and most often it is changed according to the season. The carpet that you had in winter season may not suit in summer and vice versa. Choosing the best carpet for home is equally difficult, because there are thousands of varieties of carpets in the market. But a friend of mine helped me choose the best carpet for home, because he happens to work with an upholstery shop and he knows everything that one should know when choosing a carpet. He shared some awesome tips and tricks on how to choose the best carpet and that’s what I am going to share with you in this post. We are going to learn a few surprising tricks that will help you choose the best carpet for your home. We’ll also discuss about how to keep it clean and tidy. There are different materials used for carpets, some are fiber, nylon, polyester, acrylic, wool and blends. For summer, the best can be the fiber ones and polyester. I do not suggest wool because that is specifically for winter. In summer you need that texture of carpets that will help in air circulation, will keep the room cooler and also really go well with the season. When you are returning from the scorching sun, you would not like to put your feet on woolen carpet, and if you have to, then you will find it very disturbing and unpleasant. Nylon is the most common material which is used for carpeting. Nylon is durable and long lasting and it is also resistant to wear and tear. But these carpets cannot repel stains and marks. Though there are various carpet cleaners available in the market, still the nylon carpets are most well known. More or less all carpets have 40-50% nylon in them, and after that they are dyed. Polyester carpets are cheapest among all other fibers, but they are not that durable and long lasting like the nylon ones. The polyester carpets must not be used in busy rooms like drawing room and kitchen. These carpets have a soft feel and you can use them in bedroom. The acrylic carpets feel like wool, but they are not as expensive as wool carpets. It is resistant to mold and mildew which is a plus point. The mixture of all these fibers will create blended carpets. They are better in look and feel and are also long lasting and durable. You can use it in your room and this can be there the year round. Its seriously important to look for the right colour when choosing a carpet. If your room is small, then it is better to go with lighter colours like white or cream. These shades will make the room look larger than its actual size. But the problem is. these colours will get dirt easily and the stains and the marks will be prominent. The dark shades of carpets will look good in large rooms, and also in spaces like drawing rooms and dining hall. These common areas have more traffic and the chance of stains is also high here. In personal spaces like bedroom, you can stick to the light shades. For kid’s room, you can use the bright colour carpets with geometrical designs and floral patterns. In the summer months, you do not need the floors to be 100% covered. Rather, you will like walking barefoot on the cold floors. So, instead of using wall to wall carpets, you can use the smaller carpets and rugs just to cover few portions of the floor. You can keep a small carpet near your bed so that you do not have to touch the cold floors immediately after waking up from the bed. The thumb rule is the thicker the carpet is, the better is the quality. The more the layering of the fibers, the thicker is the carpet. The thicker is the carpet, the higher will be the price. Measure with the running fingers the width of the carpet before buying it. For summer, you can prefer the rugs, and the carpets for some specific areas like the formal sitting room and also the kids’ room. In kids’ room, it is useful to give the carpet because this will ensure safety to the kids. If the kids fall down on the floor, the carpets will save them from having pain. The carpets tend to get dirtier during the summer due to the humidity in the air and the scorching sun outside. Cleaning the carpets is seriously important because you and your family members may walk bare feet on it. It has to be sanitized and cleaned properly. If you are unable to figure out how to keep it properly cleaned, then here’s what you can do to keep your carpets clean and tidy. Do not walk on the carpet wearing shoes and sandals. Open the shoes while entering the home. 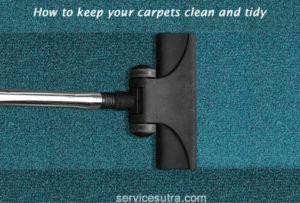 Clean the stains immediately, do not keep for cleaning later, else the stains will stick to the carpets. Clean the stains with warm water and vinegar. Vacuum clean the carpets every day. Beat the carpets and the rugs under the sun at least once or twice the week. Do not eat or drink on the carpets. While you are not using the carpet, you can fold it and then cover it with papers so that dust does not settle there. If the food crumbs enter the carpet, then clean it as soon as possible, as food crumbs can attract insects like cockroach and ants. Just a bit of precaution and attention can help you in keeping your carpets clean and tidy. The carpets can enhance the beauty of your room, so grab a perfect carpet for your room, this summer. In summer, you can go for the partial covering of the floors, and also the dark colours so that they do not get dirt easily. If you are using the light shades, then that is great too, but you have to be careful, because it requires a little more maintenance and you may have to work a bit more to keep it clean. What else do you think one should consider at the time of choosing and buying a carpet for home?